A special birthday, Valentine’s Day, Easter…whatever the occasion, it’s always in style to deck out your dog in sweet accessories. PuppyKisses.com offers an adorable variety of items to dress up your pet, but how well can they hold up to your active pet’s lifestyle? We decided to put their accessories to the ultimate test – a day in the life of a dog. Of course, the first order of business in any pet accessory is the style – and this is one area where PuppyKisses.com really stands out. They have a huge variety to match any occasion. 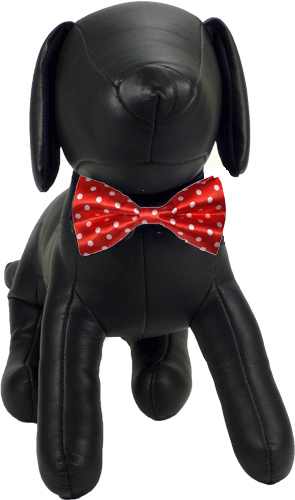 We tried out a spiffy red satin polka-dotted number called the Valentine Dog Bow Tie, and it was truly adorable. The color was bright and eye catching, an the material was of a really nice quality. Putting it on was a piece of cake. The bow ties are designed to attach to the collar, rather than going around your dog’s neck. This is great for safety reasons (no need to worry about it getting caught on things and causing a strangulation hazard), but it also makes them easy and comfortable to wear. The bow ties hooks around you dog’s collar with velcro, making it easily customizable to a variety of different collar sizes. So how does it hold up to your active dog’s lifestyle? Great! The velcro attaches quite securely to the collar, and we had no issues with it falling off. Because the collar is already centered on your dog’s neck, the bow tie hangs perfectly in whatever position you’d like it to be. 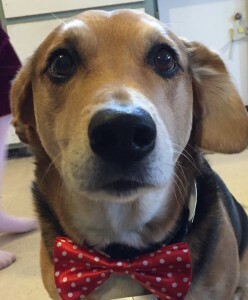 Your dog will look stylish, whatever the occasion – and you won’t have to worry about him losing the bow the minute he gets outside. They’re a great choice for family pictures, a special wedding, or any occasion where a little extra style is in order.